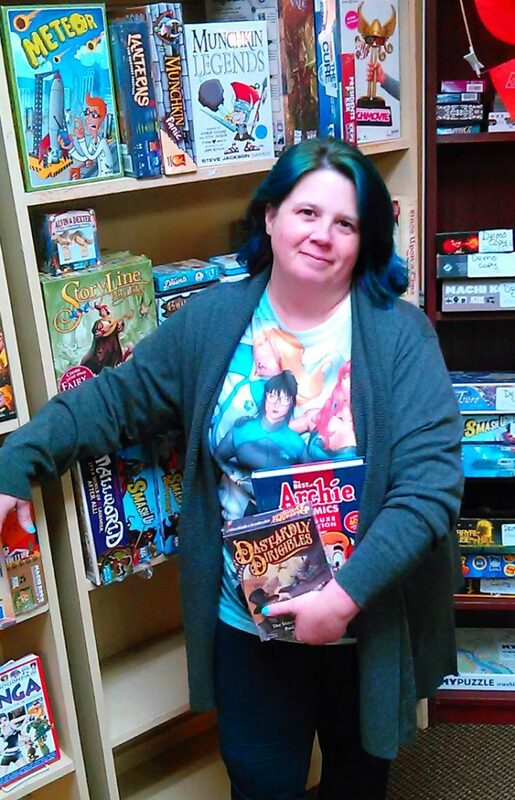 Of Dice & Pen is a tiny little game store located in Aaron's Books just north of Lancaster, Pennsylvania. Owner Sam Droke-Dickinson answers our questions this week. What was the catalyst for opening a games store? My husband and I both grew up playing board games and some D&D, and we did so with our own son. Traditional "American" popular games (Scrabble, Clue, Yahtzee etc). A few years ago some friends introduced us to "European" games and we were hooked. At the same time we were looking to add new products to our bookstore. Something unique that other shops in town weren't carrying. We met with another bookstore in a neighboring county who had been carrying board games for about a year and they encouraged us to contact their sales reps with distributors. So for the holiday season of 2015, we brought in about a bookcase full of games. Ones we knew and played ourselves so we could handsell them. They flew off that shelf and we did 3 re-orders that month. Over the course of 2016 we added more, and by the Fall decided to dedicate an entire area of the store to games with tables for free play, and to start hosting game nights and D&D. Our bookstore opened in 2005, so we were already established as a family gathering spot in our little town. Adding games just seemed a natural fit. It's grown in the 2 years the "Of Dice & Pen" area officially opened, but not in the way we expected. There is already one really good FLGS in our area, so we didn't pull in as many "gamers" as we had thought. We mostly cater to casual board gamers and families looking for something other than a screen to do with their kids. Where we did explode was D&D, and have grown a great nurturing community around our RPG games. Sadly, our store is not wheelchair accessible (we're in a 200-year-old building in a historic town that can't adapt exteriors for ramps and lifts), but once someone is in the door we've made sure to be accessible to everyone (wide aisles, best stock at arm/eye level, flat floor). We pride our selves on being a welcoming environment. We have a "All are Welcome Here" sign on the door so the minute someone approaches us they know they are in a safe space. We have our "rules" posted in the game section and make it very clear that our tables and store are open to EVERYONE, and if you exclude at your table you are not welcome. We also work on being a "no judgment" zone. Who cares if it's your first or 200th game, you are valued and are welcome to be yourself and make mistakes. FLGS and IndieBookshops are "third places" , a community spot to gather, discuss issues, play, meet others. The box stores, kickstarters, and online places may offer "deals" but they don't give a dang about you and your games. They want your bucks. We care. We talk to you. We find the game that matches your needs not what an algorithm tells you after you bought a ream of paper and a grill on the site. And we connect shoppers with each other through game nights, events, and just introductions. Story: we had two couples that had been shopping with us for a few months. We encouraged them to join one of our bookclubs, where they met each other for the first time. Then when we hosted a Star Trek RPGs & the husbands came, barely knowing each other. They are now best friends, and good friends to us who we socialize and play games with outside of the shop. The wives have joined D&D games in the shop, and they have started 2 other home games with more people we introduced them to through our game nights. You can't get stories like that by clicking a mouse to save $10. Fun! We want everyone to know they are welcome, no matter level, experience, or interest. We want everyone to find a game (and/or book) that gives them enjoyment.